← Will Nubian children have to go to the African Court? Because of our common history, the similarity in the social, economic and political problems that afflict us and the strong possibilities that we can find common solutions to these problems, there is now an urgent need for us to start trying to learn from each other’s experiences. It is an irony that our scholars, judges, and legal practitioners know more about European law than about the law of neighbouring countries. 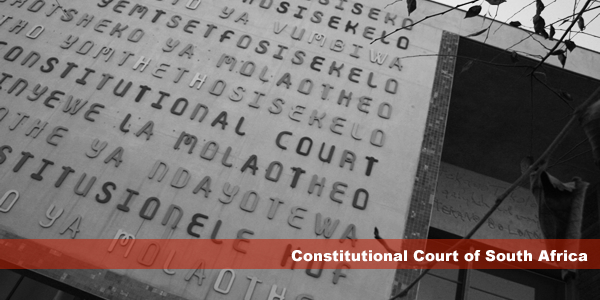 For example, the South African Constitutional Court during its first ten years relied extensively on the jurisprudence of foreign courts. Hardly any of this jurisprudence was from an African court. Nevertheless, the quality of the South African Constitution, enhanced by the jurisprudence from its Constitutional Court provides better material adapted to the African condition for African constitutionalists to learn from and borrow than the continuous reliance on inherited colonial laws. There are now more opportunities for an intra-African judicial dialogue which should hopefully lead to cross-systemic fertilisation of ideas and better laws adapted to our present realities, especially in the area of constitutional law. The rapid advances in information and communication technology in the last two decades have resultednot only in judgments, but also an extraordinary amount of constitutional material from different jurisdictions being available at the click of a mouse. The benefits of this will be completely lost if national legal experts and judges are too unbending and stuck with the past to see the benefits of learning from what is happening elsewhere on the continent. But an important way of overcoming this artificial mental barrier could be through cross-national networking of judges from different legal jurisdictions. Such personal contacts between judges will enable them to share their experiences and see how judges occupying similar positions elsewhere often confront the same kinds of problems. Although there are in existence many fora where judges from different countries meet, with the exception of the recently established Judges’ Working Group in the African Network of Constitutional Lawyers (ANCL), these have often been along regional lines and provided little opportunity for judges from the different legal African legal systems actually mixing. One will also expect that as the numerous regional and continental tribunals in Africa become more active,the process of cross-jurisprudential fertilisation will be intensified. The global influences that can certainly enrich and enhance the effectiveness of national constitutional laws may be lost not only due to blind attachment to inherited colonial stereotypes but also the inability to understand foreign and international constitutional law material. There is now a need for a new era in constitutional law scholarship that must be informed and guided by knowledge in the techniques and methodological insights of comparative constitutional law with an African focus. It is only when there is some familiarity or understanding by African constitutionalists and judges of the legal systems that operate in the other African countries that there can be serious intra-African legal dialogue. The common colonial experiences and similarities in economic, social and cultural conditions suggest that solutions adopted in one African country, could more easily be adapted in other countries on the continent than those produced by the continuous reliance on imported Western models for no better reasons than sentimental attachment based on previous colonial ties. The Institute for International and Comparative Law in Africa has now taken a lead in promoting this judicial dialogue with an African comparative law focus. Charles Fombad is a Professor at the Centre for Human Rights. He also heads the Unit on Comparative African Constitutional Law at the Institute for International and Comparative Law in Africa based at the Faculty of Law at the University of Pretoria in South Africa. He holds the degrees LL.B (Yaoundé), LL.M and Ph.D. (London) as well as a diploma in Conflict Resolution (Uppsala). i partly agreed with the opine that African jurisprudence is crucial in creating stable Africa in terms of rule of law. however, i humbly with the opinion that the very european laws we adopted as Africa can guide africans in deliberating the laws governing africa. if we view law as positivists, i would agree with the writer, though, i question myself on coherence of the constitution to the african values. are we living the african spirit in the positive nature of the received laws? the answer is no, we dont because they dont fit the context, and they have in bigger part failed to help africans realize and preserve their african values. the intention isnt to have laws but to have laws that fit the african context and drives african spirit home. africans wont be aliens of their continent. thank you. thanks prof this excellent topic as more important ideas lead us to wake up and stand to development our legal system and justice in our continent. we in 21th century,the sciences with all divisions have developed by the idea of individual and then captured by institutions and other companies.Africa is rich with traditional legal values just need to reseasch for reform and redeveloped.SO to develope our domestic constitutions to justified to achieve the justice objective in our societies as well as respect and portect human dignity and human rights in general more important.so my support strongly you to do these in the ground and to be live as soon as possible . I share your view that African judges should consider cases not only from Europe and the US but also from other African countries. There are many sources freely accessible on the internet that lawyers and judges can make use of. However, when you state that ‘the centre of modern constitutionalism might well be moving to Africa’ I think you’re exaggerating. Many African constitutions makes for good reading for anyone who thinks a society should be based on human rights. However, constituionalism goes beyond what the constitution says. I think more focus should be given to the outcome of constitutional litigation. Did the judgments really change the lives of the persons involved and those in a similar situation? I heard about this blog on EJIL Talk! and I’m very happy with this possibility to learn more about african concerns about law and human rights. I hope this “cross-fertilization” may cross the Atlantic and spare some seeds here in Brazil and America. Please stay tuned for more articles on the rule and role of the law in Africa. Nevertheless, it can be also a simple fact that a lot of wonderful accomplishment tales are actually scripted by dotcom ventures. elfillergibberilliczw dsqzxwyxlh However they might be uncovered, and discovered very well, and negotiating for a lifestyle and organization is actually a most valuable skill, for being employed in each and every predicament wherever its use will make sure small business results. I agree with you Prof, that it is time for Africa to make use of the very rich jurisprudence developed over the years, particularly in respect to human adjudication. I think this is the driving force behind the organisation by the African Court of three continental judicial dialogue seminars in 2013, 2015 and 2017 respectively. With such efforts being made, notwithstanding the slow pace, African is getting there..